Like fast Fords? Like multirole fighter aircraft? Perfect, we have the ideal car for you. 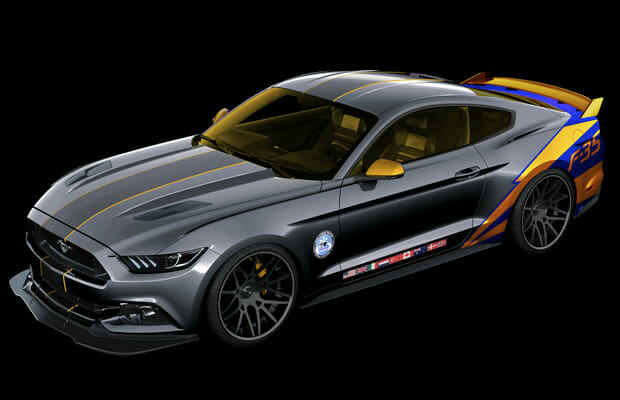 Ford has announced it will auction off an F-35-inspired 2015 Mustang at the upcoming 2014 EAA AirVenture air show in Oshkosh, Wisconsin. Ford has been a longtime supporter of the event, previously having donated an SR-71 Mustang, a ‘Stang commemorating the Tuskegee Airmen, as well as Blue Angels and Thunderbird examples. This version includes custom paint, a carbon fiber splitter and rear diffuser, and a pair of Recaro racing seats. Bring your wallet though, Ford’s Blue Angels car sold for a whopping $400,000. The car rolls across the block on July 31.